Getting to this point in his career was certainly no easy task for Team Lakay veteran Honorio “The Rock” Banario. 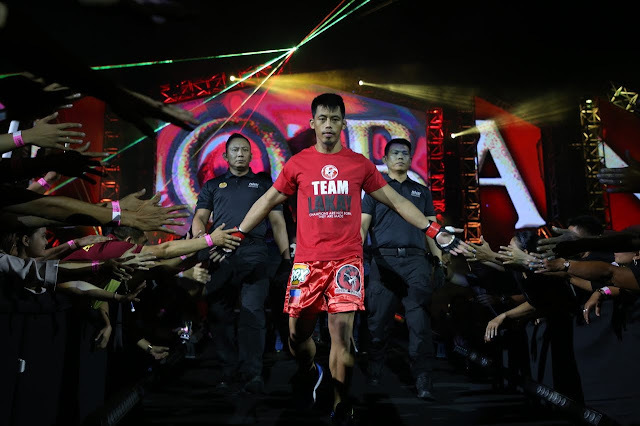 Now that he finds himself resurgent in ONE Championship’s stacked lightweight division, the 28-year-old former ONE Featherweight World Champion wants to give credit where credit is due. A huge factor in Banario’s re-emergence as an elite competitor is his time spent with his Team Lakay mentor, a man whom he considers as close as it gets to family. Banario and former ONE Lightweight World Champion Eduard “Landslide” Folayang have been each other’s main sparring partner for the greater part of their careers, and together, they have been able to help each other become among the promotion’s top talents. For Banario, having Folayang in his corner, helping him throughout his career has been a blessing. When “The Rock” hit rock bottom in his career as a professional martial artist, he found solace in Folayang’s encouraging words, telling him to constantly push through no matter the adversity. “When I was at the lowest point in my career, he was one of the strongest voices that told me to keep going. He motivated me and gave me hope. He’s like my older brother,” Banario said of Folayang. The two have spent extensive time on the mat together, grinding and learning, growing in unison. While their careers have taken different trajectories, their paths always seem to convene on the strength of their work ethic, as they pushed each other to the maximum on a daily basis. Having a sparring partner to consistently test his mettle, Banario says, is one of his greatest blessings as a martial artist. Being able to count on Folayang giving him a rough workout kept Banario evolving as a competitor, and it showed each time he stepped into the cage. “Whenever we spar, we really test each other’s limits. I think for the both of us, it’s really a good thing that we’re able to have each other to really push it,” said Banario. Today Banario is one of the top lightweights in ONE Championship. He is currently riding a five-bout win streak, and is looking to score his sixth straight victory when he meets Singapore’s Amir Khan at ONE: BEYOND THE HORIZON, 8 September in Shanghai, China. Working with Folayang again for his next bout, Banario details what it is exactly about Folayang’s style that is the most difficult to overcome -- and it’s something Banario himself is trying to develop in his own mindset. “Eduard’s style is very difficult to deal with. He has amazing cardio and he will keep the pressure on you and never stop. It’s exhausting to spar with him. But perhaps his greatest strength is his unwavering will to win,” explains Banario. Learning however, is a two-way street. While Banario has picked up a lot from the former lightweight kingpin, he hopes that Folayang continues to find equal value in having him as a sparring partner. Nonetheless, Banario remained humble as always and is extremely grateful for his opportunity to work with one of the best martial arts talents in the world. “I think I learn more from him than he does from me,” Banario concluded.